Tell us about your background and your current role at Ausenco. I have over 28 years of experience in the bulk terminal and transportation industry, including 15 years as Engineering and Environment Manager for a Vancouver based bulk terminal facility. 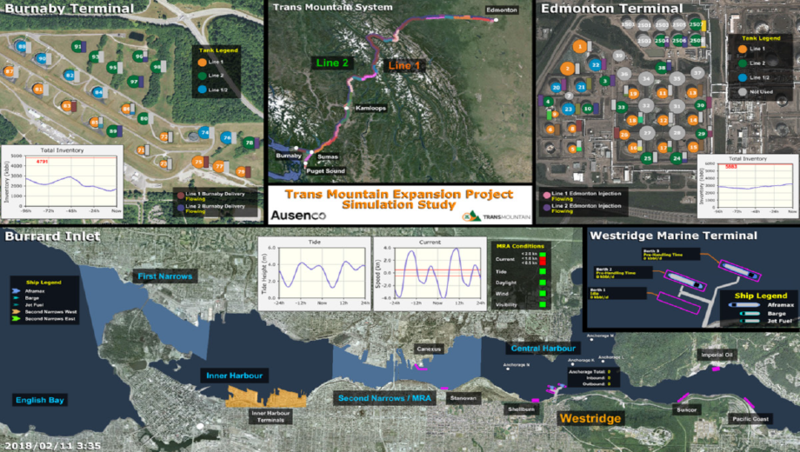 I joined Sandwell in 2005, which was acquired by Ausenco in 2008, and have held numerous positions in my tenure ranging from Project Manager to General Manager for the Vancouver Operations. My current role as Vice President, Transportation & Logistics consists of early client engagement, ensuring that our group is ahead of market trends, and establishing the appropriate resources in our various geographic locations. Additionally, I take a key role in developing our brand awareness and promoting Ausenco’s simulation capabilities through conferences, presentations and thought leadership efforts. How do our Simulation services provide value to clients? Over the last 25 years, the Simulation team and the services we provide have evolved to meet the dynamic needs of our clients. We are experts in identifying the effects of interdependencies and variation in complex supply chains on KPIs like throughput, handling rates, storage requirements, and equipment availability. Our services offer clients a means to understand their operations better, leading to targeted investments in their assets that result in overall improvements and lower capital expenditure. The services we provide are not specific to any commodity or industry. While our simulation services apply to any system where materials move in a process, we historically have delivered the best value to our clients by optimizing their logistics chains. Often this will be applied to a portion of a logistics chain local to a production site or an export terminal, but the best results come from studying the entire supply chain network from the production facility to the end-destination of the product. What is the team’s process when undertaking a new project for a client? We typically help optimize the life-cycle costs of our clients’ assets and operations. For existing facilities that require optimization, we build a model that is calibrated to years of detailed operating and financial data to ensure that they reflect actual operations and forecast future performance accurately. These real-time discrete element models allow us to analyze their supply chain network and facilities to demonstrate what their throughputs will be, identify their challenges and bottlenecks, and help clients understand their options for long-term expansions. Our services are not restricted solely to optimizing existing projects. For new projects, we rely on previous benchmarking information that we have gathered from our database of past projects to build a new model that applies the best practices of their respective industry. We’ve expanded the use of our tools in the mineral processing side of our Minerals & Metals business, working with mining clients to model their back-end processes from pit-to-port, in particular looking at ROM ore processing and milling. This work has created great opportunities to bring value to clients in rightsizing their equipment, understanding their throughput, and establishing the ideal number of spares to be provided while minimizing both capital and operating costs. A great example is the Rosemont Project where we performed dynamic modelling of their dry stack tailings disposal system. When it goes into production, the Rosemont Project is expected to be one of the largest copper mines in the United States, and the dry stack tailings system is a critical element in the permit conditions for water conservation. This system is an expensive portion of the plant to build, and our modelling tools were used to reconcile the reliability of the equipment and to optimize the number of operating components and spares installed as part of the overall system. What is TLS software and how is it implemented into our services? TLS (Transportations Logistics Simulator) is a simulation software tool that we developed in 2002 because the off-the-shelf tools at the time could not design the complex models required for our clients’ projects. TLS is one of our differentiators as ultimately, other tools are comparable to our software, but most cannot simulate the complex models that we are required to deliver to our clients. When we license TLS to our clients, we provide them with the training to operate and modify their model based on their preferences. However, most clients return to us for significant updates of their models if the original project has expanded or has reached another phase of its life-cycle. For the Oil & Gas sector, many clients have licensed our software and continue to renew their licenses, recognizing the value of its modelling/simulation capabilities. A recent project example where we have applied TLS is the Dalrymple Bay Coal Terminal (DBCT) in Mackay, Australia. Over the last 10 years, DBCT has undergone various expansions to meet the unprecedented demand by global markets for the Bowen Basin’s premium quality coal and is now one of the world’s largest coal export facilities with the capacity to ship 85 Mt/y. The terminal is owned by a consortium of shippers/producers that decided that they should get another opinion and went to one of our competitors to build a model. After hiring another provider, investing a year’s worth of effort and a considerable amount of money, the provider was not able to deliver results. The DBCT Management team ultimately came back to us to redo their model and subsequently have used our software as a long-term operating tool for their plant. What differentiates our Simulation team? The team’s main differentiators are the people and their backgrounds. Our team is composed of analysts and experts - most with backgrounds in engineering. Our lead programmer holds a Master of Mathematics, providing him with an understanding of the intricate calculations required to program the TLS software. The engineers on the team have years of practical experience in the industry and work closely with our Transportation & Logistics team (among other teams) who aid in the validation processes and help us better understand the models we deliver to our clients. In many cases, our competitors may not recognize when a model is not delivering realistic results, due to simply being number crunchers. In contrast, our experts draw upon their technical background to recognize problems in the simulation model outputs and can apply the appropriate adjustments with the client to drive value in the results.